If you are under the impression that you need a lot of money in order for you to purchase a home, you are sadly mistaken and the purpose of this article is to show you 2017 Low Down Payment Mortgages. These aren’t mortgages that are hard to obtain and as long as you have a competent loan officer like myself, you shouldn’t have a worry about this. Gone are the days where you had to save for over 5 years in order to get the 10-20% down payment for a mortgage. There is no need to get crazy with saving when it is easy these days to get a 2017 Low Down Payment Mortgages. As long as monthly rent amounts are increasing across the board, now is still a great time to turn long-time renters into buyers of their first home. If you are renting and have just minimal savings, there should be no reason why we can’t get you a loan. To be honest with you, on a $200,000 home, are you really comfortable putting down $40,000 when you don’t have to? If you think about the recession we just came out of, it may be the best idea to keep that money invested and saved rather than investing in a home. If anything drastic should happen, that $40,000 will be gone and you will not have access to it. My advice is to take a serious look into the loan options below and then reach out to me so we can go over the best fit for you. You can reach me at 888-900-1020 or contact@loanconsultants.org. 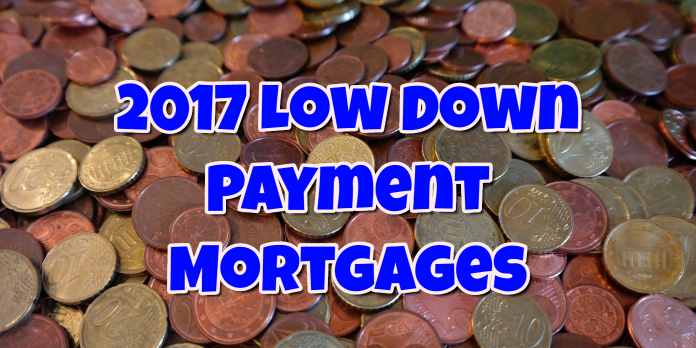 The first and most popular option that is available for 2017 Low Down Payment Mortgages is the FHA Loan with a 3.5% Down payment. FHA Loans are loans insured by the Federal Housing Authority and as previously discussed these loans are the most forgiving of all the loan programs out there. The main concern here to obtain a 3.5% down payment mortgage is to have a minimum credit score of 580. With a 580 FICO you can get a loan with a 43% debt to income ratio and with a 620 FICO you can now get a loan with 56.9% debt to income ratio. Yes, there is a mortgage insurance premium or MIP associated with this loan, but you will definitely NOT break the bank looking for a down payment. It is easy to see why this is the most popular loan available. Another attractive loan of the 2017 Low Down Payment Mortgages for potential borrowers is a Conventional Loan with a 3% down payment. This loan is not nearly as popular has the FHA Loan, but is an option for borrowers none the less. If you look at the 3% down payment, it can be 100% gifted by a blood or marriage family member. The downfall with this Conventional Loan is that you will need a minimum of a 620 FICO score in order to obtain this loan. The problem with getting a Conventional Loan with a small down payment and a low credit score is that fact that the corresponding rate for these loans could end up being more expensive than the FHA Loan. As mentioned earlier, if your are hesitant to making a decision on which program is right for you, you need to reach out and we can walk you through your options line by line. Our goal is to get you in a mortgage that best fits your situation and goals accordingly. If you have read any of my recent articles about VA Loans, you will quickly see that if you are a veteran of the United States Armed Forces, have put in your minimal service, and have obtained your Certificate of Eligibility this is a great loan option for you. With a VA Loan there is not a minimum credit score required, however most lenders will ensure that a 580 FICO at minimum is had by the borrower. There is also no debt to income ratio and you can have a DTI ratio as high as 60% and still find yourself getting a home. VA Loans also allow for up to 4% seller’s concessions which can be used to cover all your closing costs and funding fee to obtain this loan, making it truly no down payment and even no money out of pocket. If you’d like to take advantage of any of the 2017 Low Down Payment Mortgages you need to reach out today and we can get a loan program picked out for your exact needs. We are available days, nights, weekends, and holidays to serve you better. We look forward to working with you and making sure you get that dream home you’ve always wanted!